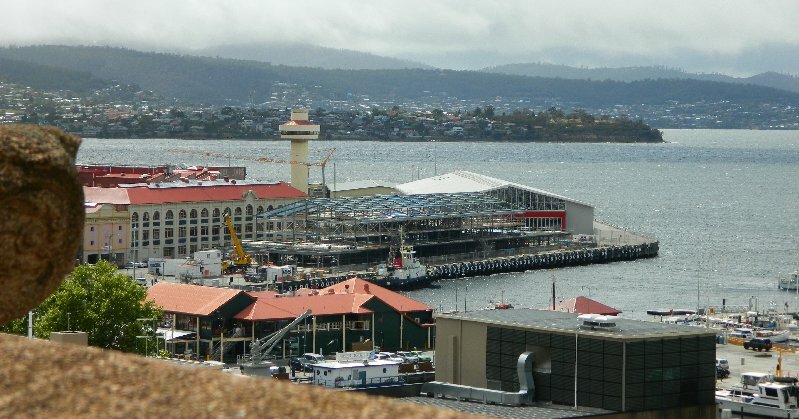 Last week was Architecture Week in Hobart and for the past couple of years an event called Open House Hobart has been held to enable members of the public to get a look at buildings they would not normally be able to visit. Over the weekend numerous places were open, some only had guided tours which had to be pre-booked and others were open access for a day or part of a day. I did not hear about it in time to book anything but decided to go to Hobart on Saturday and see if I could visit a few. I am interested in history and I have very strong preferences about the type of architecture I like. I’m also a sticky beak and love to go to places that I would not normally see so this was perfect for me. I visited about four different places all located in the CBD. First of all I went to the Colonial Mutual Life Building in Elizabeth Street. I have often admired this building which I pass often on my way to and from the bus stop but I’d never seen inside. Volunteers at the door directed me to the lift to go up to the roof. I was pleased because as Hobart does not have many tall buildings I don’t often get a chance to take pictures from high up. The Colonial Mutual Building in Elizabeth St. Hobart. Up on the roof I found that the parapets were decorated with gargoyles and that there are hand painted terracotta tiles up there. The building, which is offices with shops and cafes at street level, was built between 1934-36. Here is one of the many gargoyles. I think he’s rather cute and not scary at all. Here is another gargoyle. I have no idea why a building from this period would have gargoyles. Here are some hand painted terracotta tiles. Aren’t they beautiful? I also got some photos of the waterfront including one of Macquarie Wharf. There were a couple of open sites over there too but you had to book for those so I missed out. The construction site is a new hotel being built next to the cruise terminal. My next stop was the Town Hall in nearby Macquarie St. Initially I went through the front entrance and decided that as long as I was there I should visit the flower show that was being held upstairs. I took some pictures of the flowers and the grand room where the exhibition was held. I’ll show you those another day. Realising my mistake I then left and went round the corner to the car park in Elizabeth Street where I was able to enter the basement which was what I had come to see. This part of the building was constructed in the 1860s and is four rooms which were the Constable’s and what look like they were once cells. It is dimly lit with just a few greenish lights and there was a rather creepy soundtrack playing softly in the background. I am sure it must be a mecca for ghost hunters. I don’t see very well in the dark but there were a few people who had brought torches wandering about so there was enough light so that I didn’t trip over anything. The walls of the rooms had marks and drawings on them which I don’t know the story of but I wonder if they were done by some of those long ago convicts who were confined there. This is on a wall in one of the Hobart Town Hall underground rooms. Eery lighting in the underground rooms. For my next stop I chose something totally different. Further down Macquarie St is an apartment which has been built as a modular unit and hoisted atop an office building. It is tourist accommodation and I was curious to see inside it and see the views from it. The apartment has two bedrooms with ensuites and an open plan kitchen/ living area, a BBQ area on the roof of the office building and a deck looking out over Davey Street. I heard the Manager telling some people that the rate was $500 a night or $600 for weekends which she described as “very affordable for two couples”. Certainly not in my budget! I would love to wake up to these views though. One of the two bedrooms. The deck that runs the length of the apartment. The view of Davey St from above. Self Portrait in the bathroom mirror. The view from the south bedroom looking towards Mt Wellington. After leaving the apartment I walked down to Davey Street to photograph the exterior of it and then went into St David’s Park to visit the Rotunda. As you know St David’s Park is a favourite spot of mine and I had often wished I could go up into the Rotunda. You get to it from a door in the bottom, climb a flight of stairs and come out via a large trapdoor. I think it is a great pity that they don’t hold concerts in the park any more except for the Christmas Carols concert. Stairs to the stage area. In the Rotunda at a last. I hope you have enjoyed a glimpse of a few different parts of Hobart as much as I did. I will certainly try to visit a few more properties next year. The colonial building looks beautiful, I like the look of this architecture pretty much. The gargoyles are indeed not that creepy, I still remember the creepy gargoyles in Ghost Busters and other movies 😀 The underground rooms remind me of the time when I was still partying hard, we often were in Berlin on electronic music events in those dark bunkers and tunnels that were built in the WW2 time… in the modern time they were often used for techno events , since the scary and shabby appearance fits so well to dark electronic melodies and heavy beats. The apartmen you shot looks great too, “very affordable for two couples”, yea, it’s just the half of what my Nikon camera did cost, I think I could afford to sleep a night there if I save a half year (laugh). The rooftop panorama you shot is cool too, I like these type of photos… and the other photo with the painted terracotta tiles, that’s where I would have shot a flat photo, it would make a nice texture for 3d graphic design, a beautiful texture that could be used for creating realistic roofs of 3d houses. All in all, cool photos! Glad you liked them Dennis. It was a really good opportunity to see a lot of different things. Do you have similar events in your city or in other German cities?